This is not a really driver bug, so I post it here. After I click Report Issue button, it redirect me to this address "https://www.amd.com/report " which is not exist. I finally got this "http://www.amd.com/Pages/PageNotFoundError.aspx?requestUrl=http://www.amd.com/report ". 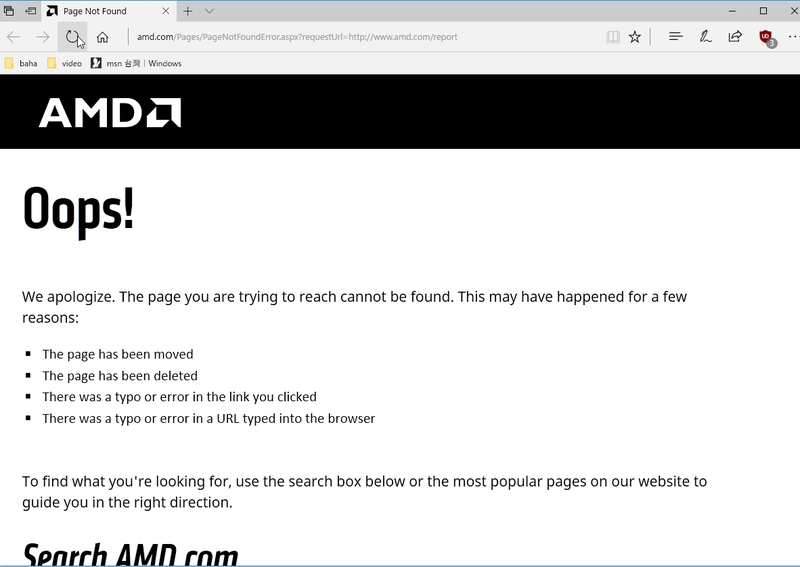 It seems it should be "http://www.amd.com/report" which is without http"s" to direct to real site. It works okay here. Which browser are you using? I'm using Chrome. I am using Firefox 54 as default browser. As you said that it works in your configuration, so I tried Chrome and Edge, all the same bug. It redirect to https and finally give me a 404 not found page but the after the url parameter is telling http. But if you use http address directly and manually input it, it will works. Okay, thanks. Please wait for our next driver and see if it works for you.